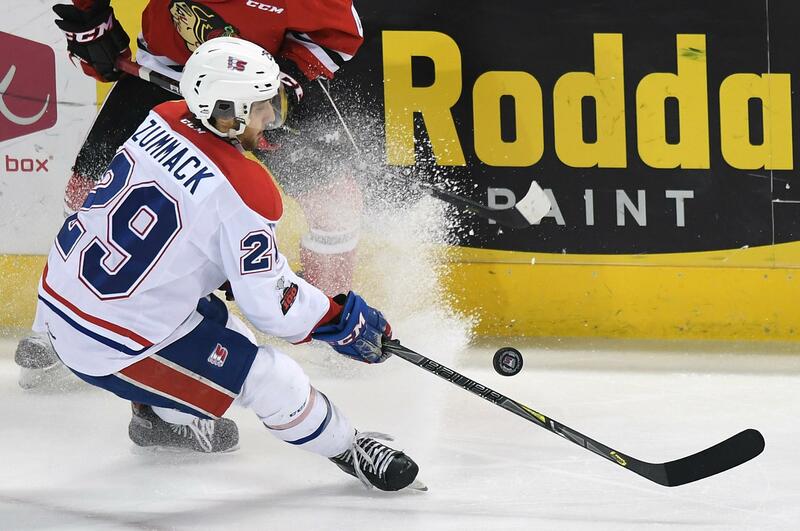 Mon., June 25, 2018, 9:16 p.m.
Spokane Chiefs forward Eli Zummack has been invited to the Toronto Maple Leafs’ development camp, according to the NHL team. Zummack, 18, went undrafted in the NHL Entry Draft over the weekend but was ranked 184th by NHL’s Central Scouting after posting career highs in goals (15) and points (41) during the 2017-18 season. The Kelowna, B.C., native earned the Chiefs’ Most Sportsmanlike Player award after recording only four penalty minutes in 58 games played. He is one of 27 forwards and 46 total players invited to the camp, which will begin Monday with on-ice testing and medical exams before on-ice practice sessions on Tuesday. The Chiefs announced on Monday that they will open their 2018-19 regular-season home schedule with Bud Light Opening Night on Saturday, Sept. 29 against the Kootenay Ice. The full 2018-19 regular-season schedule will be unveiled by the Western Hockey League on Tuesday. It will mark the second straight Chiefs home opener against Kootenay; Spokane fell to the Ice, 2-1 in their 2017 opener at Spokane Arena. They’re 2-1 all-time in home openers against Kootenay. Spokane will open its full regular-season schedule on the road on Sept. 22. The Chiefs announced that they have acquired 2000-born defenseman Bobby Russell from Kootenay in exchange for a conditional fifth-round pick in the 2019 WHL Bantam Draft. Russell, a 6-foot, 164-pound defenseman from Langley, B.C., appeared in 41 games as a rookie with Kootenay last season, scoring one goal and adding six assists. He appeared in five games as a 16-year-old with the Ice during the 2016-17 season. He was originally a sixth round (123rd overall) pick by Kootenay in the 2015 WHL Bantam Draft. Serge Lajoie has been named head coach of the Western Hockey League’s Kamloops Blazers. Lajoie spent the last three seasons behind the bench of the University of Alberta Golden Bears and won a U Sports championship this year. Lajoie replaces Don Hay, who retired this past season, but remains on the Blazers staff as an advisor. Lajoie, from Bonnyville, Alberta, played seven games for the Blazers during the 1986-87 season. He played for the Golden Bears for five years. He then spent four seasons playing in Germany before entering the coaching profession. “This is an excellent opportunity for me, to be involved with such a strong CHL organization,” Lajoie said. The Blazers went 30-37-1-4 and did not make the playoffs this past season. Lajoie’s son Marc, a defenseman, was a first-round pick of the Tri-City Americans in last month’s WHL bantam draft. Published: June 25, 2018, 9:16 p.m.